Along with several other African vulture species, the Hooded Vulture is globally threatened (Photo by: J. Loughran). The Hooded Vulture, with its small body and slender bill, is on the lowest rung of vulture society. This point is succinctly made in Setswana (the official language of Botswana), as the Hooded Vulture is called motlhanka-wamanông, which means “servant of the vultures”. However, these diminutive vultures are not stupid, as they follow African wild dogs when they hunt, knowing that the dogs are excellent hunters that are likely to provide fresh meat. Sadly, these clever little vultures are under severe threat, and their numbers have declined catastrophically throughout Africa. In 2015, the IUCN drastically adjusted the conservation status of Hooded Vultures from Least Concern to Critically Endangered. It is now faced with extinction, unless the trends can be reversed through dedicated conservation efforts. Although this species occurs in large parts of sub-Saharan Africa, we are not sure how well they are faring in Botswana. Although we know that they occur in the northern parts of the country (the Okavango Delta and Chobe National Park are population strongholds), we don’t know how far individuals fly and how much time they spend in unprotected areas. We also do not know if the national population is increasing or decreasing. In response to this lack of information about a species that is declining globally, Raptors Botswana has embarked on a project to find out more about its life history. The project is part of this local NGO's commitment to using raptor research to guide national conservation efforts. 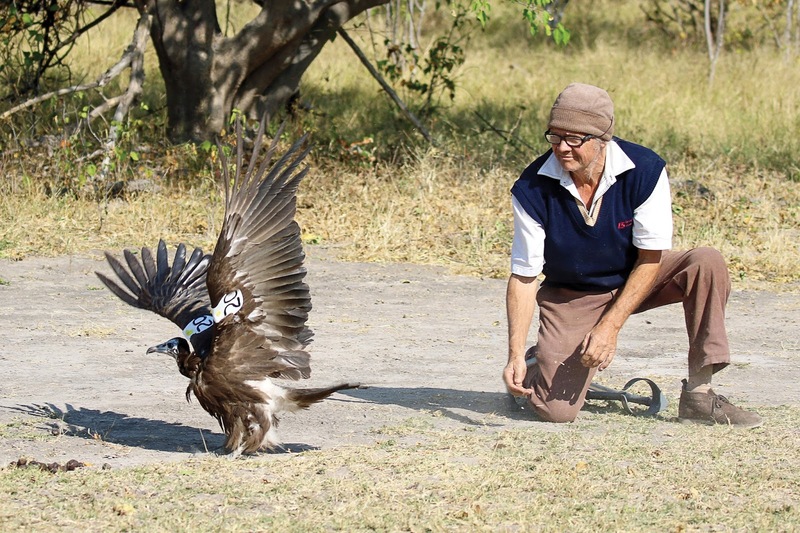 Pete Hancock, the director of Raptors Botswana, releases an immature Hooded Vulture after fitting it with a tracking device (Photo by: R. Reading). The Hooded Vulture study was recently initiated by fitting two birds (an adult and an immature) with satellite tracking devices in Kasane in the north-western corner of Botswana. The devices will help us determine the birds’ movements, and provide insights into the threats they face. Having obtained the necessary permits, the Raptors Botswana team arrived at the Chobe Crocodile Farm owned by Sue Slogrove. The farm was perfectly suited to our mission, as up to 40 Hooded Vultures visit regularly to scavenge on left-over meat that is fed to the crocodiles. This is surely one of the best places in the whole of Africa to see these rare vultures! Despite their familiarity with the farm, the birds are wild and remain wary of people. We therefore deployed our cannon net machine to catch the birds; we have used this device to catch vultures before and have found it to be a humane and efficient method. We caught nine Hooded Vultures in our very first attempt! After fitting the transmitters to two of them, the remainder were quickly measured and released. The value of using tracking devices was quickly realised, as the vultures defied our initial predictions. We thought that they would stay near the abundant, steady food supply at the croc farm, returning each day to feed. To our surprise, they soon dispersed towards the Okavango Delta, and they continue to cover significant distances each day. This information could never have been obtained without using satellite trackers, making it well worth the expense and effort. We will continue learning more about this under-studied species as the solar-charged transmitters send us their locations on a regular basis. 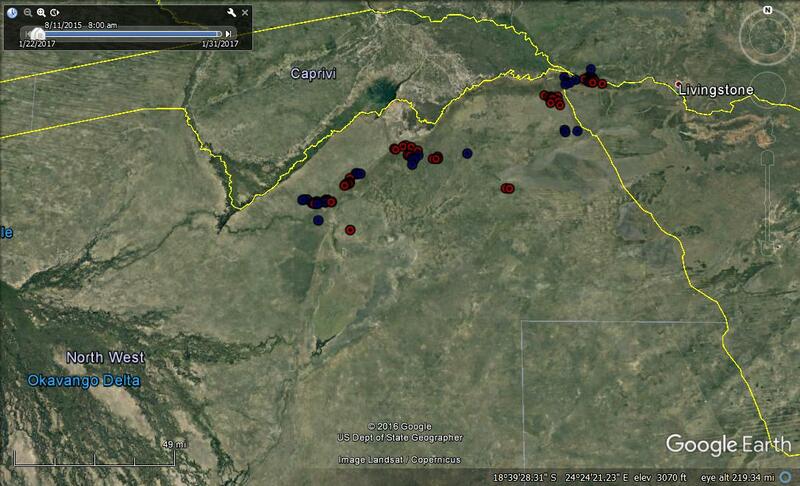 The first week’s movements of the two vultures (represented by red and blue dots) shown on a Google Earth backdrop. The capture location is in the top right. (Map by: P. Hancock). Acknowledgement: Raptors Botswana would like to thank Sue Slogrove for allowing us to catch the birds on her property, and for assisting with capture logistics.